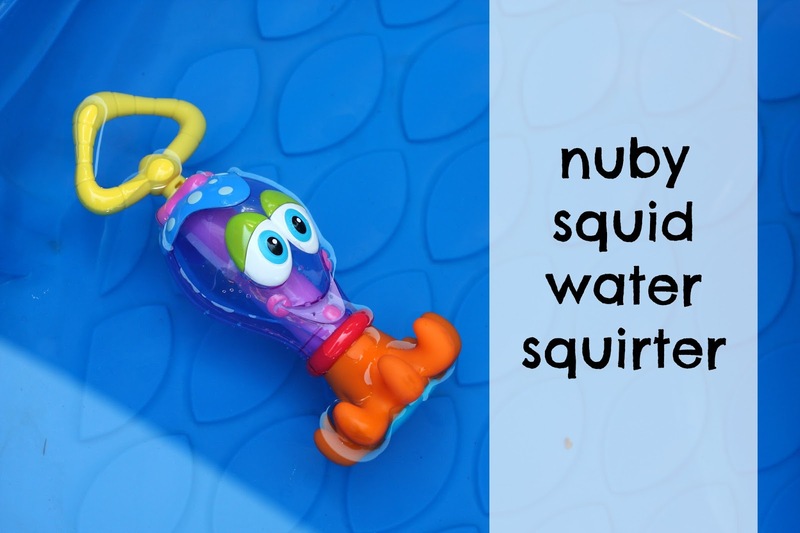 So let me just get this out of the way, as a bath toy, the Nuby squid water squirter didn't work too well for us. As an outside/pool toy, we LOVE it. You see, the first time we tried it out was in the bath. Connor pointed it at the bath wall and squirted it and all that water bounced off the wall and went all over my bathroom. So an outdoor toy it became. But let me tell you, this is a pretty amazing outdoor toy. Connor loves it. 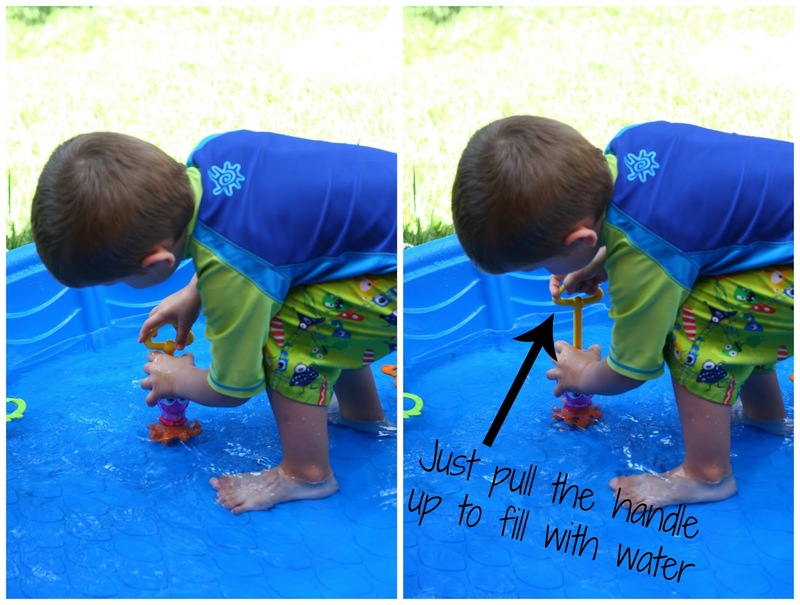 I thought the concept of putting it in the water and pulling up the handle to fill up would be a hard one to get, but he got it right away and hasn't stopped playing with it since. 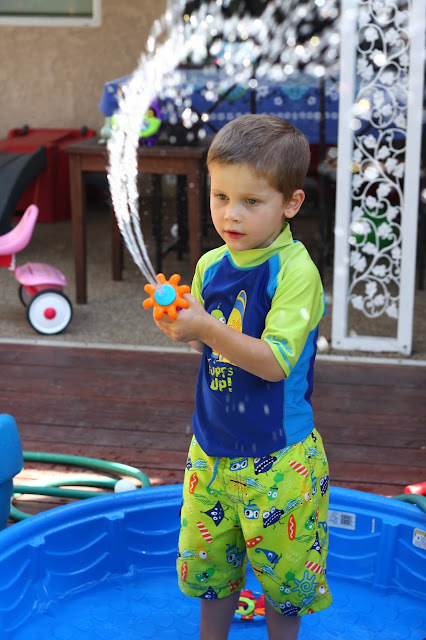 And what makes it really fun is it shoots water about 7 feet. So it's pretty fun to chase your friends (or your little sister) with. The Nuby squid water squirter can be purchased at BuyBabyDirect, CookiesKids.com, Amazon, Bed Bath and Beyond, BuyBuyBaby, echildstore.com and Diapers.com. I did not receive any compensation for this post, although as part of the Nuby Mommy Blogger program I may receive items to sample or review. All opinions are my own and 100% honest. You can stay up to date on all things Nuby by liking the Nuby Facebook Page, following Nuby on Twitter, following Nuby on Pinterest, and watching for Nuby Photos on Instagram.